Nahua of the Cuetzalan region of Puebla, the Sierra Norte, embroidered blouses, quechquemitls, traditional costume.Oct 4 is the festival of Huipil and Coffee where traditional dances are performed along with a indigenous bueaty contest. Frequently asked question about Nahua language(PDF). Information from the Summer Institute of Lingustic Study. of the origins of the Nahua Language. This gallery has been updated as of Oct. 25, 2005 following the third trip to the region. Villages have been added from the area surrounding Cuetzalan and villages from districts further to the south are now on a new page. The costumes are different enough to warrant this change. During this trip, Hurricane Stan came to visit and made the festival a water logged affair, however since this study is intended to show thing how they are today many of the photos are in the rain, making it a challenge. The festival of the Huipil and Coffee on Oct 4 includes a Nahua beauty contest from villages in the municipality. I was fortunate enough to be able to get some great shots of one of the contestants from Xiloxochico. The usual dances which occur in the square were held in the church, and the native “voladores” were held to a few limited flights n the wind and rain. I am holding back the Cuetzalan gallery because it is turning out to be a challenge to mix the two different festival dates together, I am leaving the current gallery in place. The richness of costume and the depth of custom in this region are remarkable. Within the “indigenous dress” there is change but it happens slowly and in the village the north of Cuetzalan it seems to be a change in the color of the embroidery.The costume on the right is the more traditional. In Tzinciulan, while delivering a photo, one of the official for the municipal government took my map and drew a bunch of roads on it and listed 9 villages that didn´t appear on my high tech Mexican government map. One of the towns was actually where one of my prior subject for Tzinciulan really lived. The Nahua are the largest indigenous group in Mexico, there is close to 2 million Nahua living in distinct areas of the Mexican Republic, including in some out lying parts of the Mexican capital. The Nahua are the descendents of the Aztecs and direct heirs to their language and culture. Many Nahua areas maintain strong roots to the pre-Hispanic cultures. 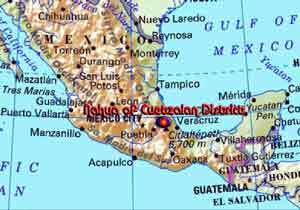 The Nahua of the Cuetzalan region share territorial borders with the Totanaca. This region was part of the Totanacan Empire which was called Totanacapan; the Nahua conquered this region in the 1500 century and force the Totanaca out of the area. The Nahua surrounding Cuetzalan and nearby regions have maintained their strong cultural roots and language. It is difficult to say how many "Nahua" live in the region, because it depends on how large you draw your circle; however including Xochitlan, Zacapoaxtla and Hueyapan region, an estimate would be around 100000. The costume of the region seems at first glance to be the same; however each village has a variation which allows the locals to tell immediately which village the person is from. The type of belt, style of quechquemitl, the cut of the blouse or the way they wear their hair can all be identifying factors.